A sculptural form book that folds flat (to 11.8 x 8.5cm) and opens to a rough circle c24cm diameter. The book has three pages, each being of “Turkish mapfold” format. The pages are joined so that each open mapfold occupies c120° of the circle. Each page has an abstract image by the author inspired by the plot of Shakespeare plays “As You Like It”, All’s Well That Ends Well” & “Much Ado About Nothing”. The text on these pages quotes known speeches from the relevant play, e.g “All the world’s a stage …” from “As You Like It”. 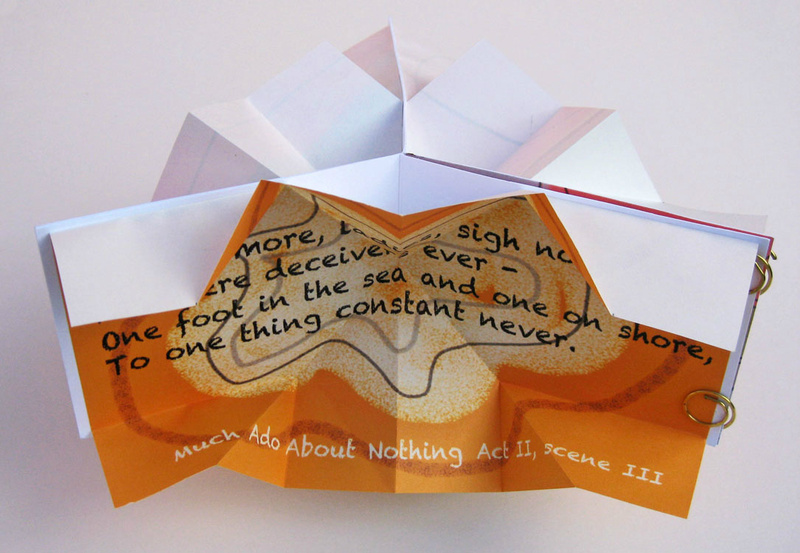 The title “As Nothing Ends Well” has parts of the names of all three Shakespeare plays used. The Sub-title refers to the resemblance of the open mapfold pages to a proscenium theatre stage.